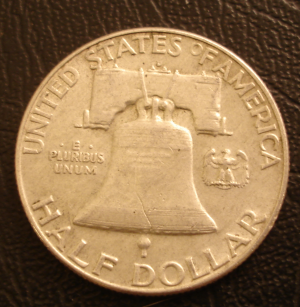 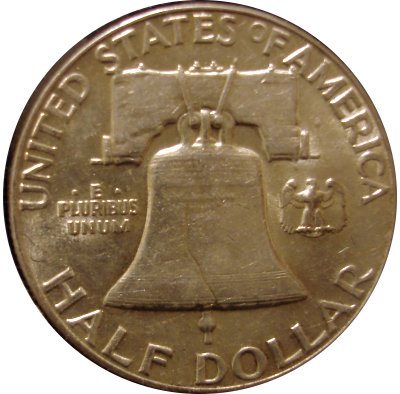 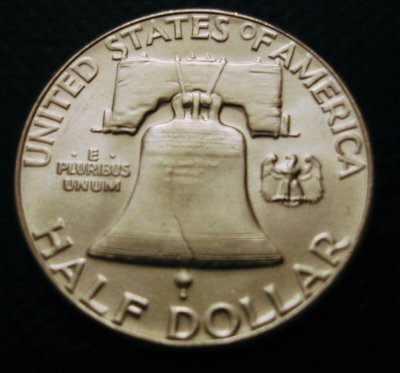 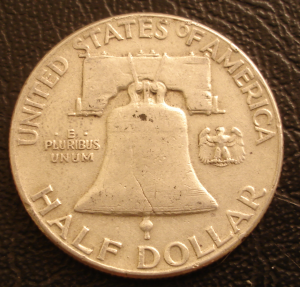 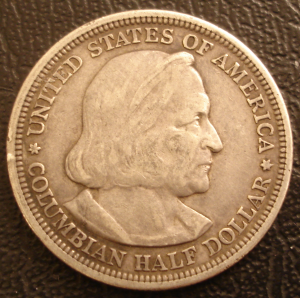 The Franklin Half Dollar is one of the odder designs of any US coin which many find specifically buetiful and fun to collect. 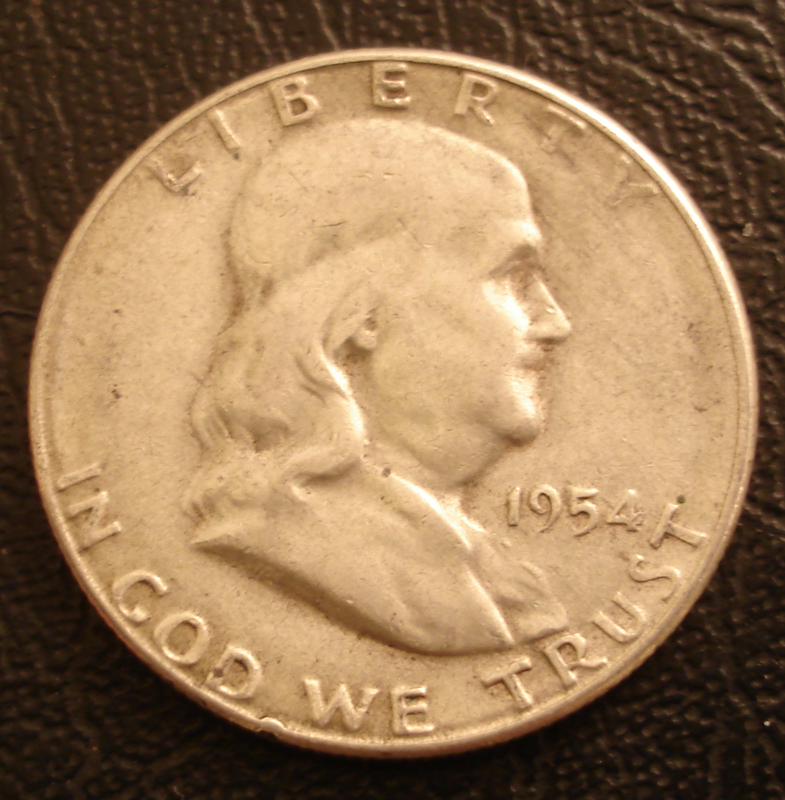 One of my friends and a moderaters at Coin Talk, Speedy is one of great Franklin Collectors that I know. 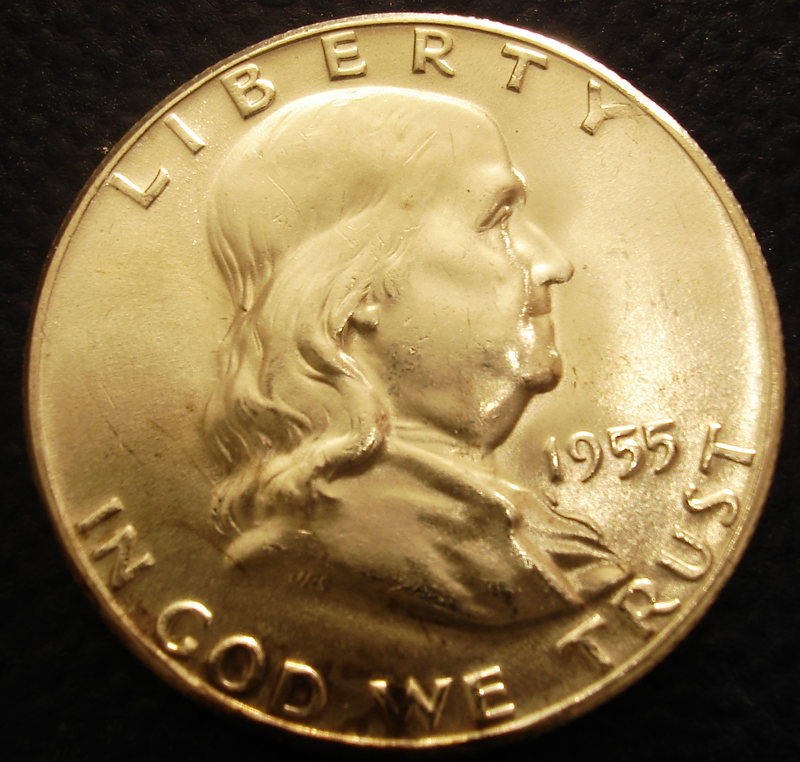 My personal introduction to the coin came when I brought Proof sets of my birthyear, 1963. 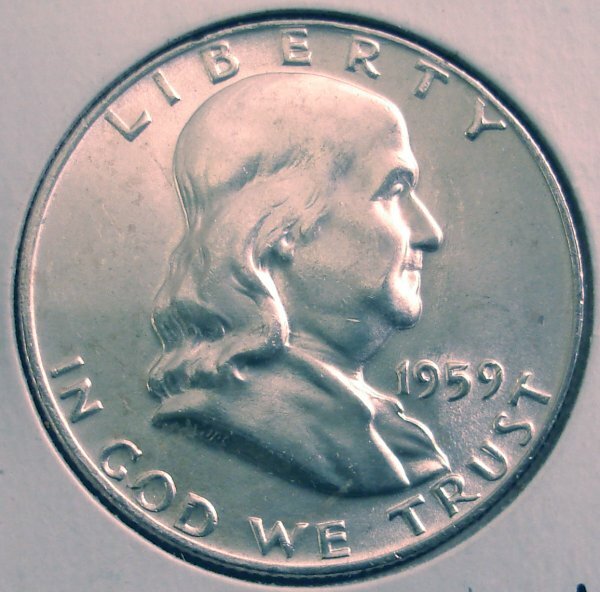 This was the last year of the Franklin Half and the Kennedy Half was rushed to production in the wake of the Presidents assasination in November 1963. 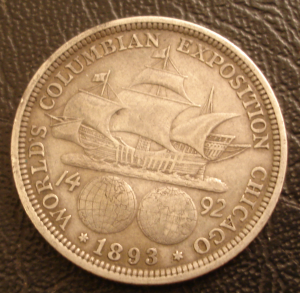 It was also one of the last years of Silver Coinage. 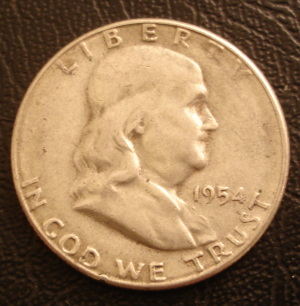 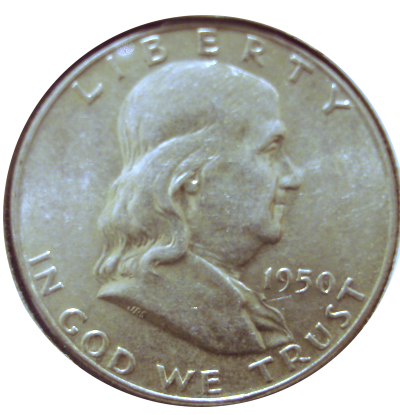 The Franklin Design is very simplistic which makes grading it a challenge. 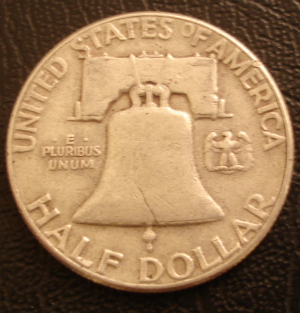 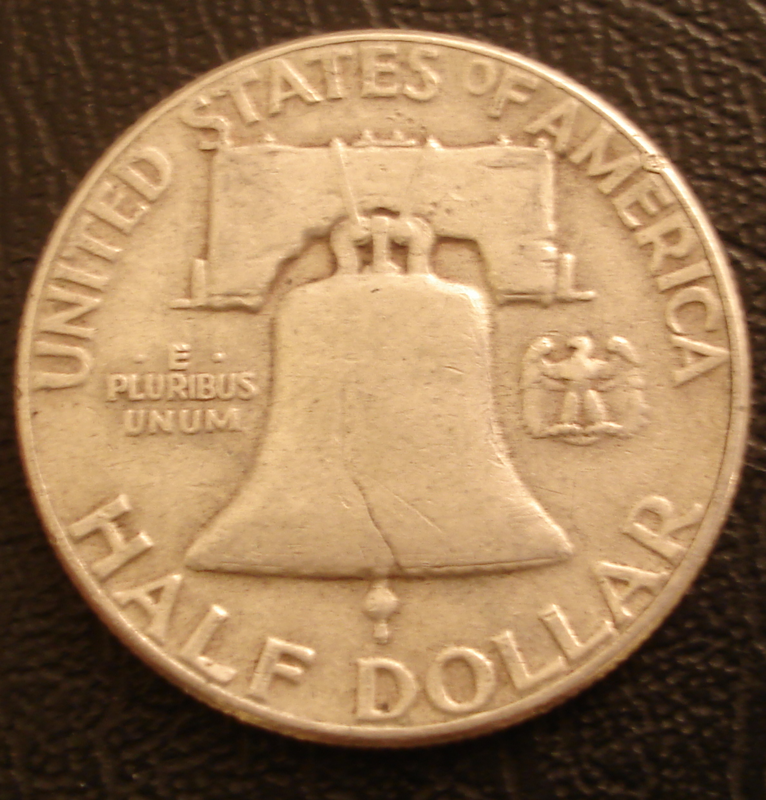 Even Proof examples of the design show many clean surfaces on the flat modellings of the profile and the liberty bell on the reverse. 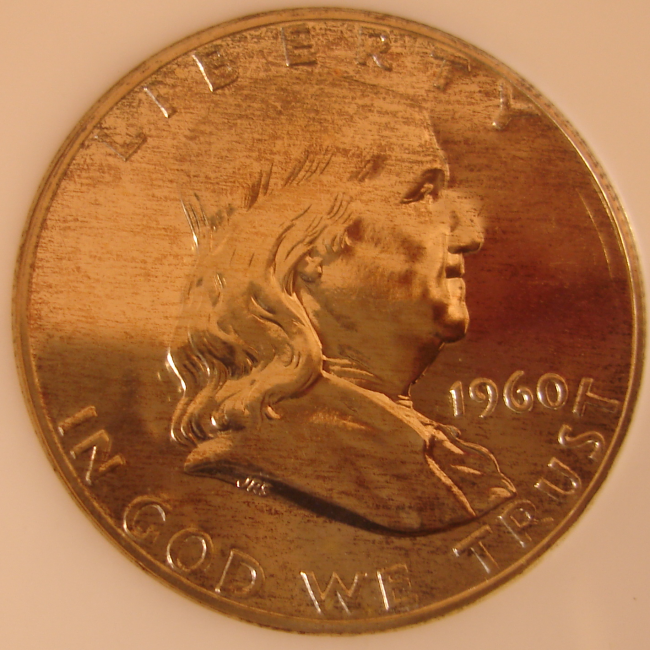 The above example is one of my better Brillent Uncirculated examples which shows many of the important features of the Fraklin Half. 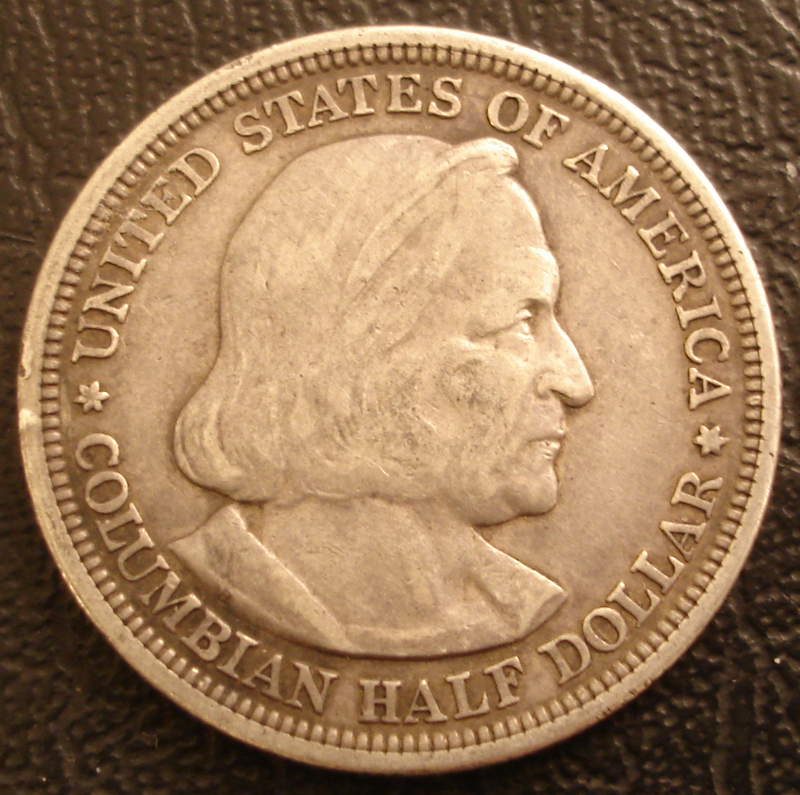 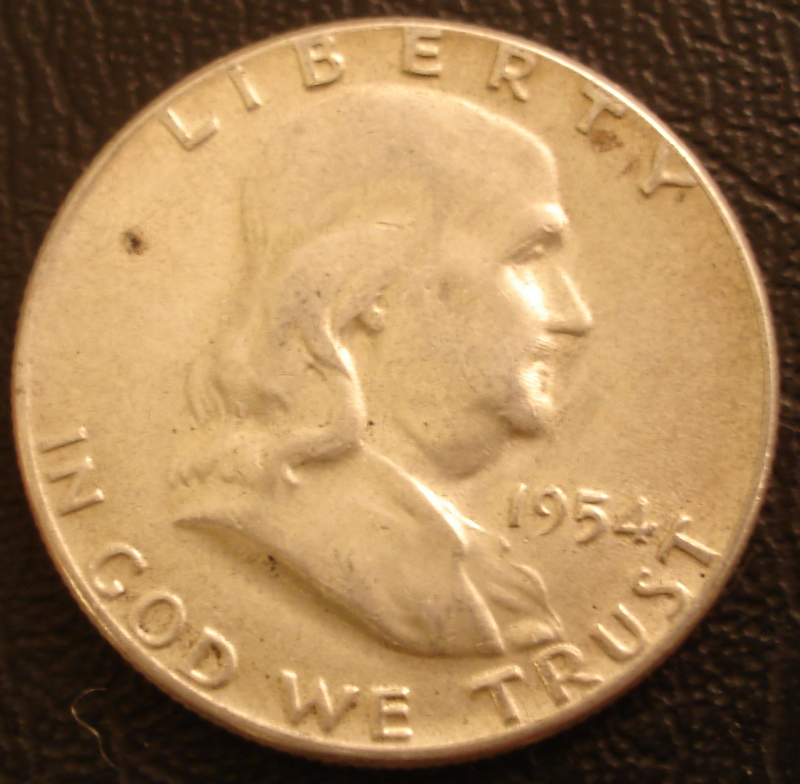 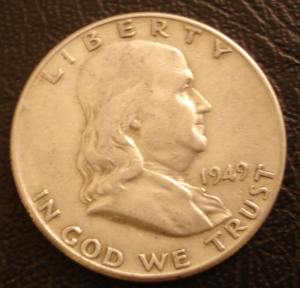 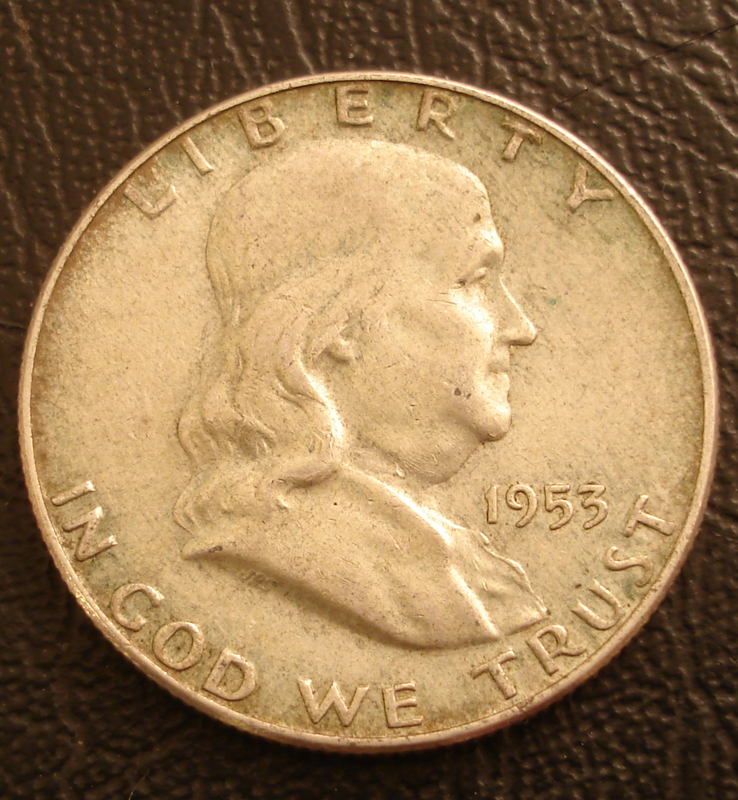 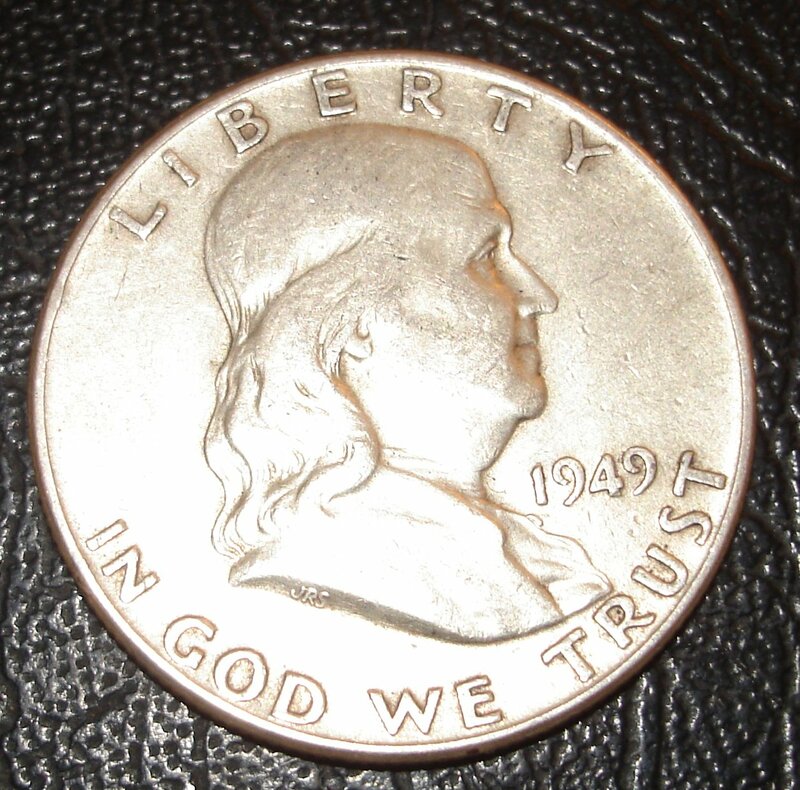 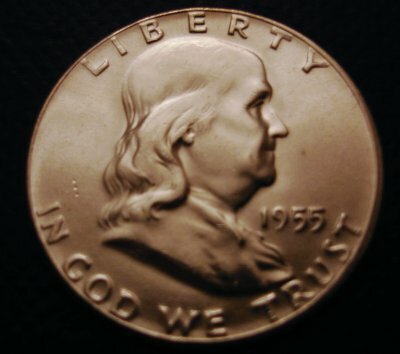 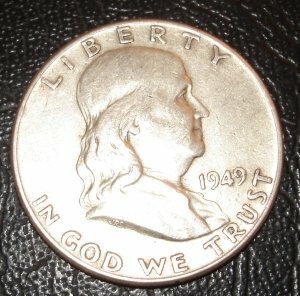 The Obverse has crisp details in the face, including clear lips and a nice clean background. On the reverse, the bells shows details of the wooden trust and good lines around the bell bottom. 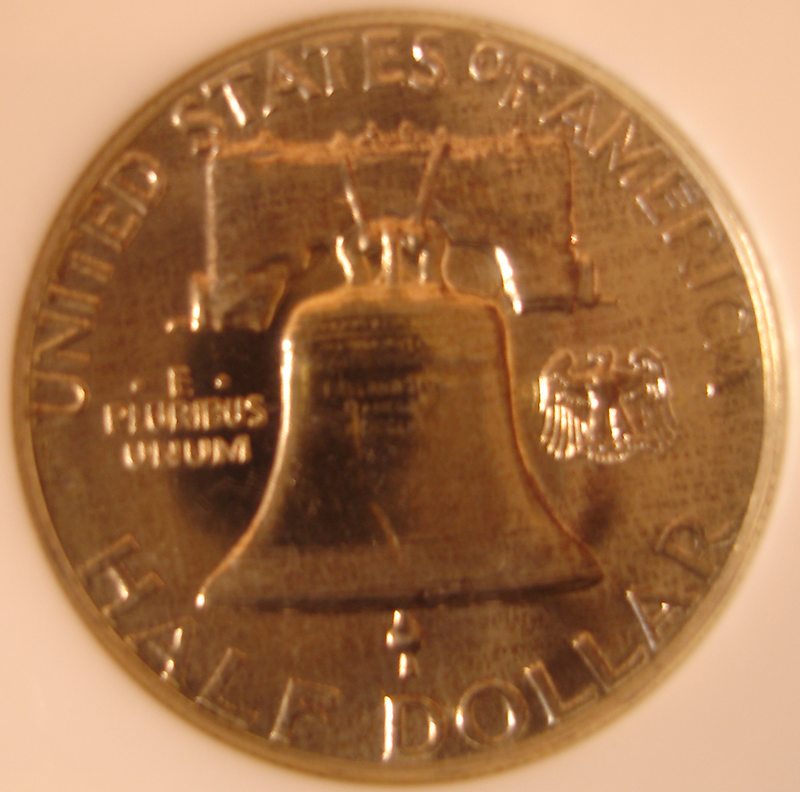 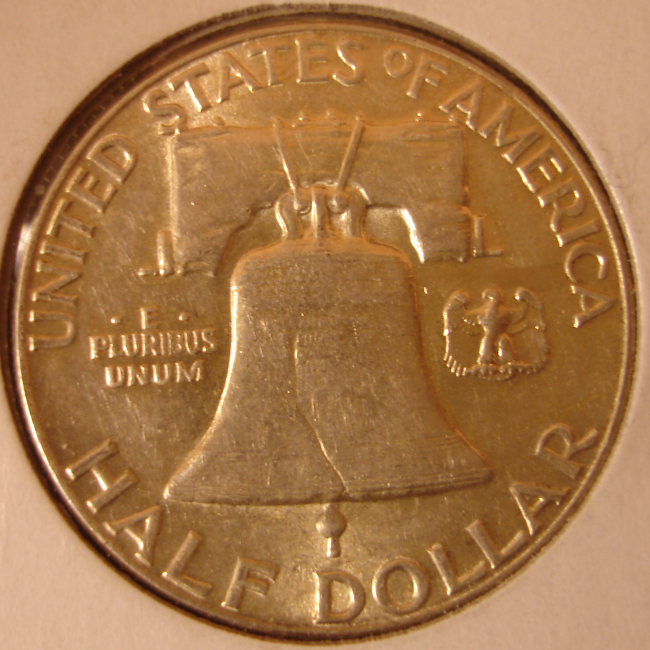 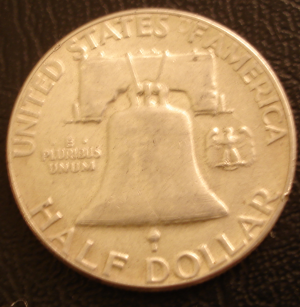 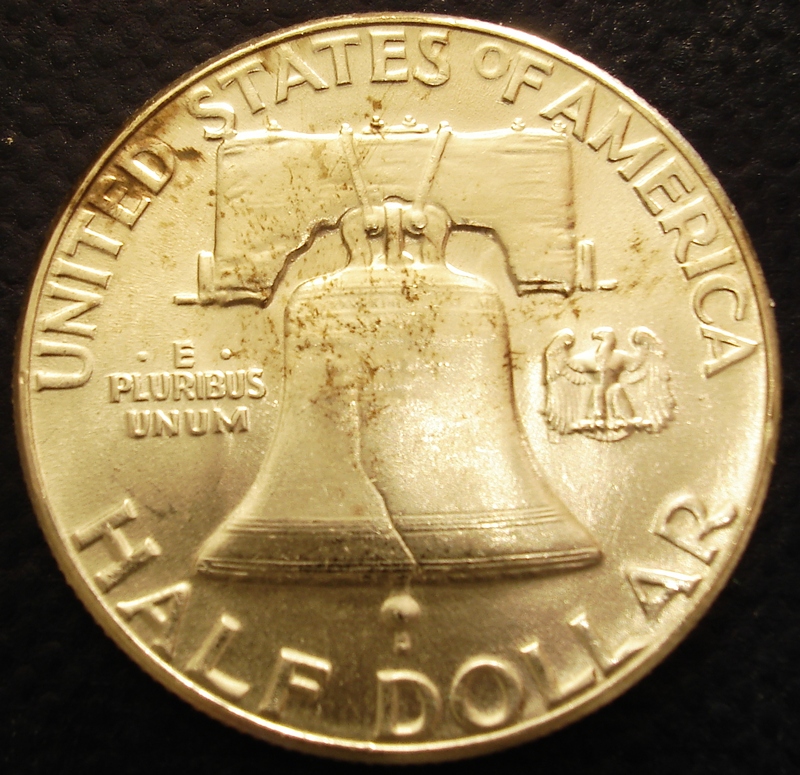 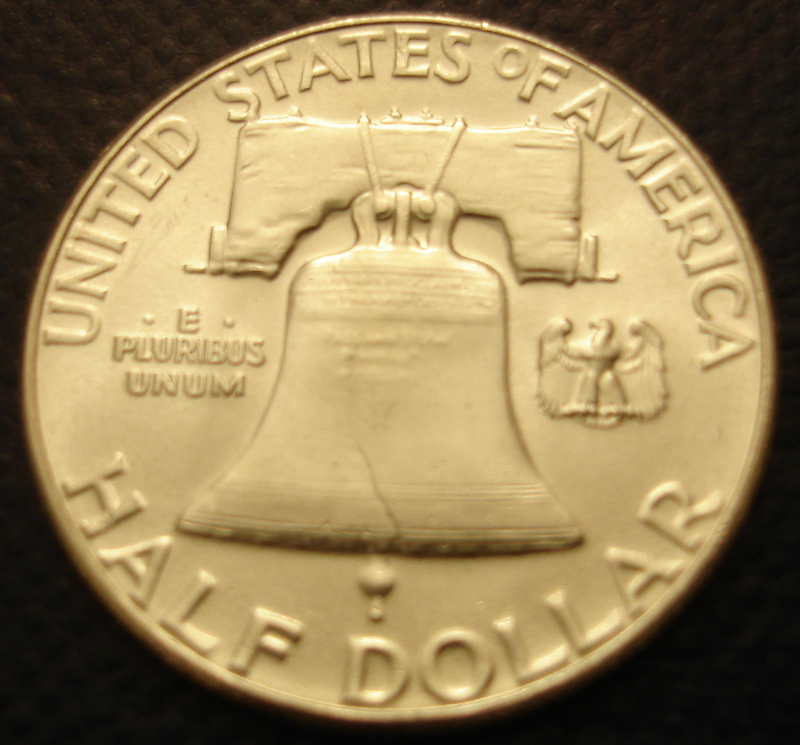 Counting the complete lines on the bell is an important feature of the grading of coins. 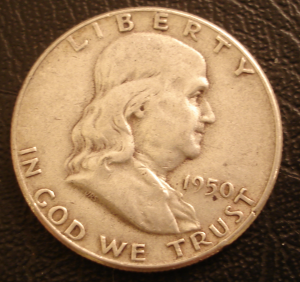 This coin has sime black gum like material, common on some Silver Coins on the upper left of the reverse of the coin. 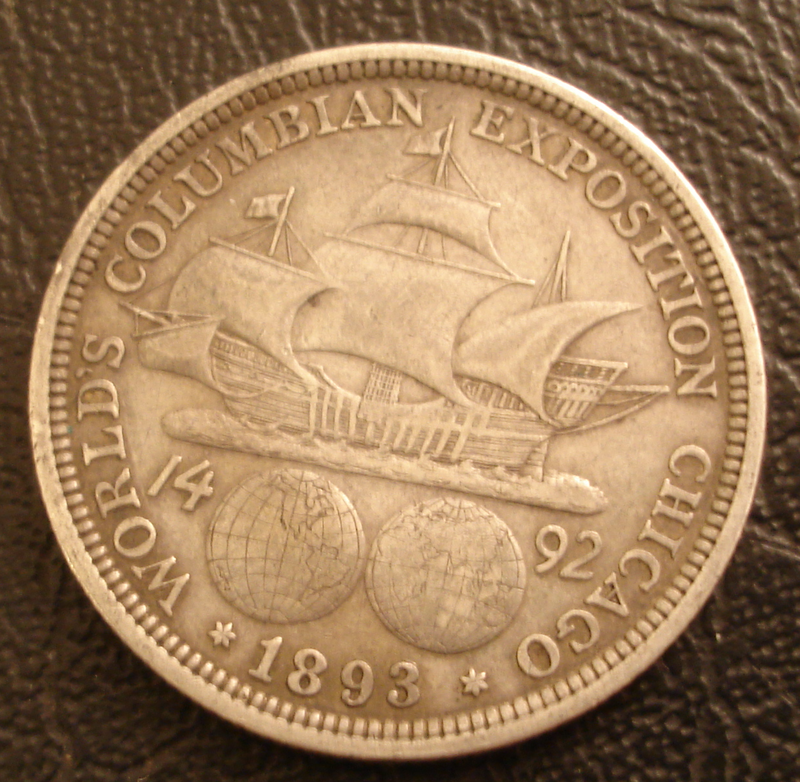 However, the coin is quite good in detail. 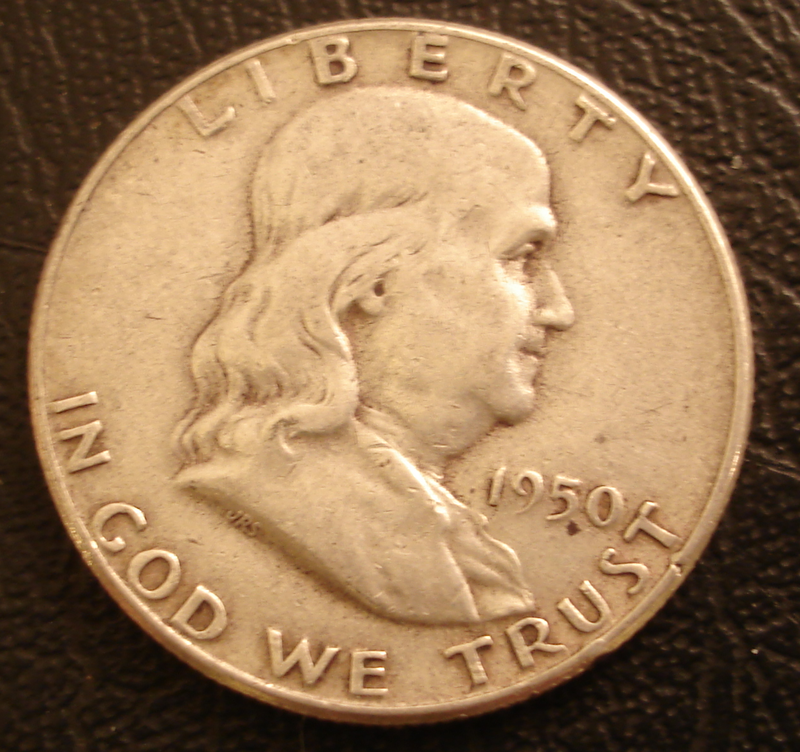 The silverness of the coin itself is a large part of the coins beauty. Other examples below show the graceful way this coin wears. 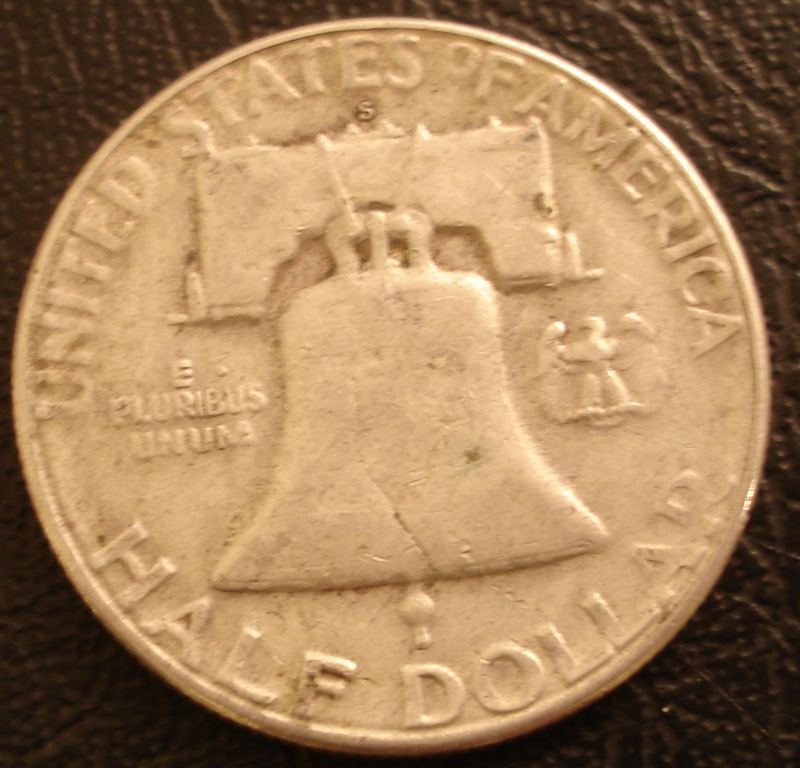 Some coins wear well, orther designs not so well. 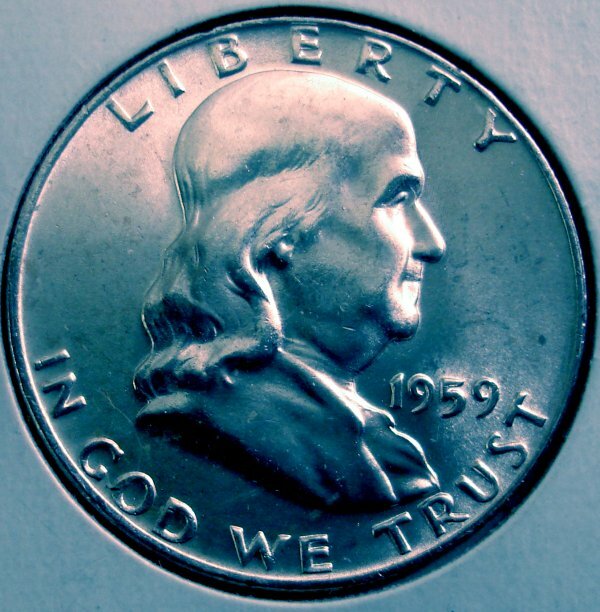 Franklins wear well. The circulated coins were recieved in change at a local Pharmacy in 2006. This is a great 1959 example which I picked up. 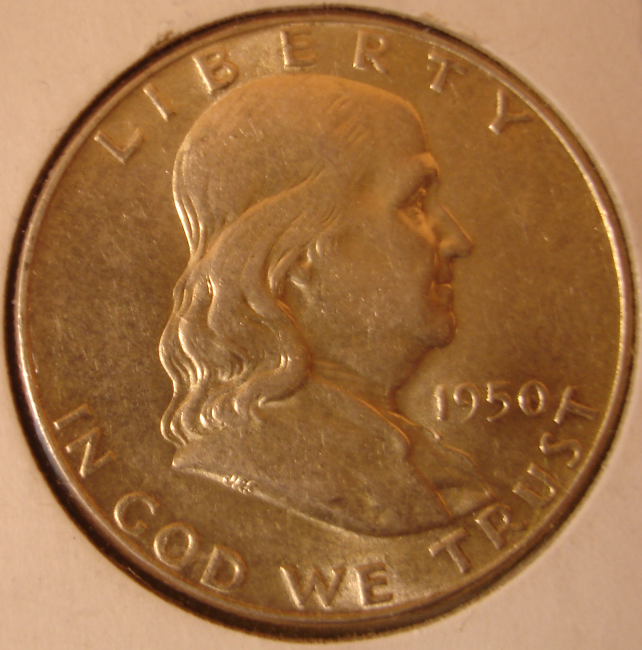 The great thing about Franklins is that they are priced right so they are an excellent starter series for children. 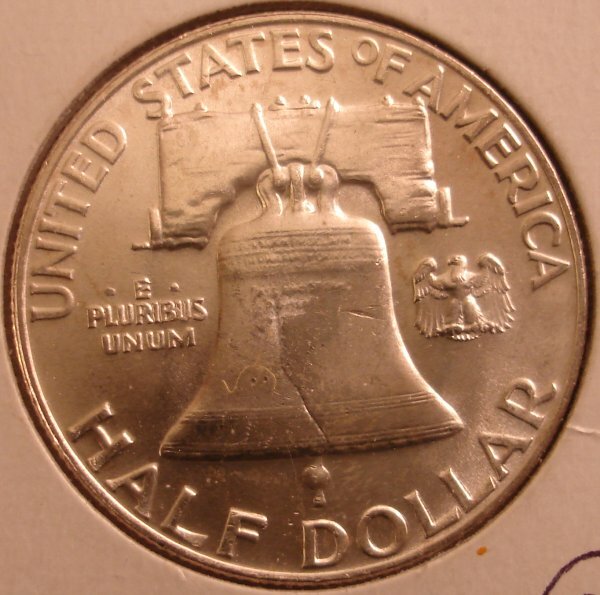 This coin has Great Bell lines.